Russia’s Soyuz 2-1v rocket made its second flight on Saturday, blasting off from the Plesetsk Cosmodrome at 14:09 UTC to deliver the hush-hush Kanopus ST satellite to orbit for the Russian Ministry of Defence. The mission marked the first flight of the NK-33 engine after 2014’s Antares launch failure that had been caused by the 40-year old engines, built back in the Soviet Union for the N1 Moon rocket. 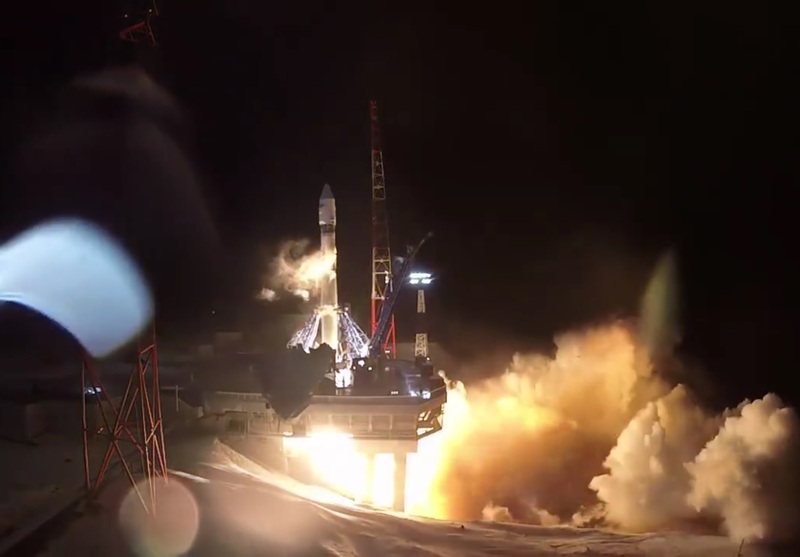 Russian officials declared Saturday’s mission a complete success after the satellite was released into its target orbit. Details on the Kanopus ST satellite are only sparsely available, as is the case for most military-operated missions from Russia. Reportedly built by PO Polyot, Kanopus ST weighs 350 Kilograms and will serve civilian and military purposes. Documents released some years back show the satellite carries a Microwave Radiometer covering a 2,200-Kilometer wide swath on the ground with a resolution of 12 to 160 Kilometers, and a multi-spectral imaging system capable of collecting imagery across a 1,000-Kilometer swath with a resolution of 30 to 50 meters. Of particular interest in the run-up to this launch was a comment made by a Russian military official who claimed that Kanopus ST would be used for reconnaissance of underwater areas in the world’s oceans to track submarines using a UHF radiometer to sense ocean surface effects. The published specifications of the instruments would not permit such a measurement, but the secrecy surrounding this launch suggests that Kanopus ST may be completing a more military-directed mission. Riding into orbit alongside Kanopus ST was a 16-Kilogram radar calibration sphere, designated КЮА 1. The polished sphere is a passive satellite released from the side of the payload adapter sitting atop the vehicle. 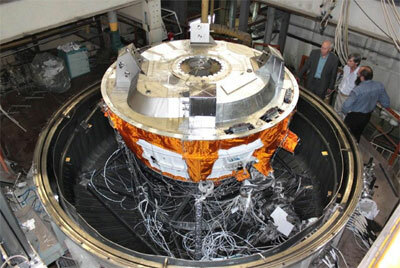 It will be used for the calibration of ground-based radars and to improve orbit determination. 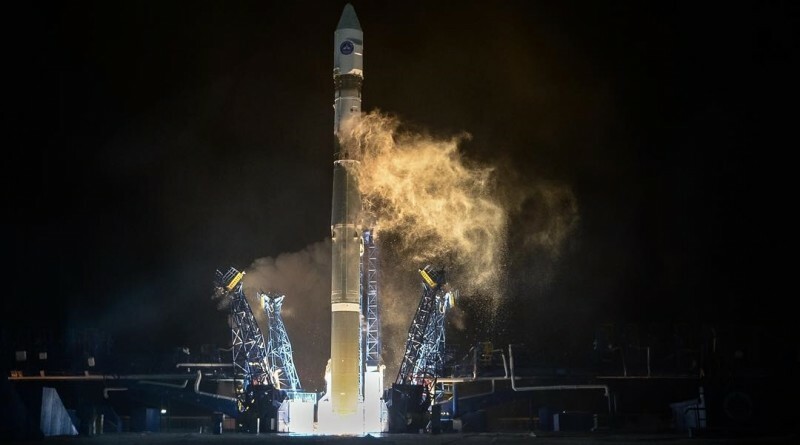 The two satellites released as part of this launch will be named Kosmos 2511 and 2512. Soyuz 2-1v made its maiden launch in late 2013, becoming the first in over 1,800 Soyuz launches not using the iconic R-7-type design with four boosters attached to the core stage of the Soyuz rocket. Departing from the Soyuz design that has been flying since 1957, the Soyuz 2-1v rocket uses a different first stage propulsion system with some additional changes to the Block A Core Stage. The second stage is identical to that of the Soyuz 2-1B and Soyuz 2-1v also uses the upgraded Control System switching from analog to digital control systems to make the Soyuz launcher more flexible. As another change to the other Soyuz 2 versions, Soyuz 2-1v can be equipped with a newly developed Volga Upper Stage that provides re-start and precise injection capability. Soyuz 2-1v eliminates the boosters from the 2-1B and replaces the conventional RD-118 engine of the core stage with an NK-33 and a four-chamber steering engine. Development of the Soyuz 2-1v began in 2008 and the first launch of the vehicle was expected within three or four years. 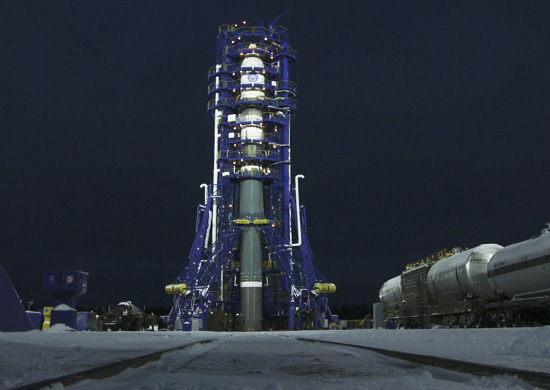 Overall, the Soyuz 2-1v launcher stands 44 meters tall and has a maximum diameter of 2.95 meters with a total liftoff mass of 157,000 to 160,000 Kilograms. The vehicle can deliver payloads of up to 3,000 Kilograms to Low Earth Orbit while Sun-Synchronous capability with the Volga Upper Stage is 1,400 Kilograms. Heading into countdown operations on Saturday after a one-day delay, Soyuz underwent final checks before starting to load the first and second stage with 145,000 Kilograms of Liquid Oxygen and Kerosene. About 30 minutes before launch, the two halves of the Service Structure were retracted, exposing the rocket as it was waiting for its post-sunset blastoff. Ten minutes before launch, the final chilldown of the NK-33 engines was started and the Terminal Countdown Sequence began shortly thereafter to put the Soyuz through final reconfigurations ahead of launch. The rocket began to pressurize its propellant tanks, purged its engines, switched to internal power and its onboard Auto Sequencer assumed control of the countdown for the final crucial steps before engine ignition. 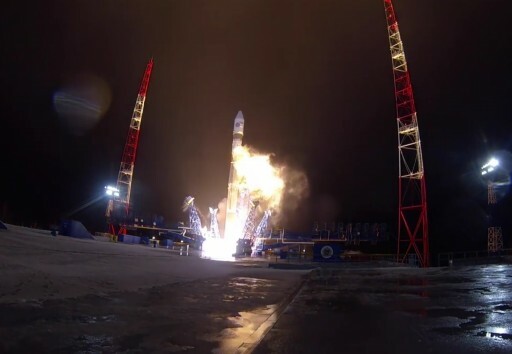 Soyuz 2-1v made a thundering blastoff from Site 43/4 at 14:09 UTC, 17:09 local time at Russia’s primary military launch site. After a short vertical ascent, the Soyuz 2-1v rocket swung to its planned ascent course taking it almost straight north to a high-inclination orbit. Powered uphill by its single NK-33 engine and RD-0110R steering engine, the rocket had a total liftoff thrust of 188 metric ton-force. The first stage of the Soyuz 2-1v shares some commonalities with the Soyuz 2 vehicles, but a number of components are changed. The diameter of the lower section of the stage is increased to 2.66 meters while the maximum diameter remains at 2.95 meters and overall length also remains at 27.8 meters. 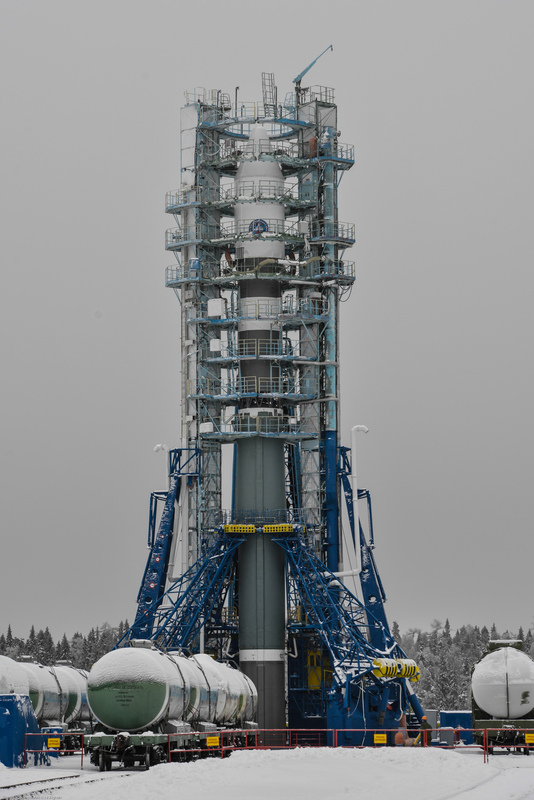 The first stage uses Liquid Oxygen oxidizer and Kerosene fuel for consumption by a single non-gimbaling 1,630-Kilonewton NK-33 engine and a gimbaling four-chamber RD-0110R steering engine that is based on the upper stage engine of the Soyuz 2-1A. RD-0110R delivers 213.6 Kilonewtons of Sea Level Thrust featuring a hydraulic Thrust Vector Control System used to individually gimbal the four nozzles of the engine in order to achieve three-axis control during first stage flight. Providing 11.6% of total thrust at liftoff, RD-0110R also contributes to overall vehicle performance and is not a pure steering engine. The first stage finished its job around two minutes after launch, separating from the Block I second stage in the usual hot-staging sequence. 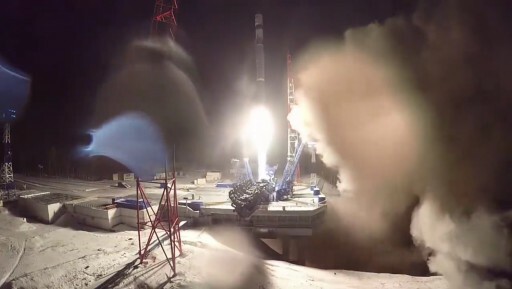 Ignition of the RD-0124 engine of the second stage occurred moments before stage separation to enable the second stage to pull away from the spent core that impacted 800 Kilometers from the launch site in the Barents Sea. Shortly after ignition of the Block I second stage, the protective payload fairing of the rocket was jettisoned, headed for an impact 1,550 from the Plesetsk Cosmodrome. The second stage of the Soyuz 2-1v is identical to that of the Soyuz 2-1B. It is 6.74 meters in length and 2.66 meters in diameter equipped with a single four-chamber RD-0124 which is a closed-cycle staged combustion engine providing 294.3 Kilonewtons of thrust operating at an exceptionally high chamber pressure. The second stage operated just shy of four and a half minutes and released the Volga upper stage into a preliminary orbit. Volga assumed control of the flight for a two-burn mission, aiming for a Sun Synchronous Orbit. The new Volga Upper Stage is a small hypergolic rocket stage that enables Soyuz 2-1v to fly complex mission profiles in order to reach a variety of orbits. Volga is 3.1 meters in diameter and 1.03 meters long with an empty mass of 890 Kilograms. The stage uses a variable propellant load of 300 to 900 Kilograms based on specific mission requirements. Volga is equipped with a single main engine providing 2.94 Kilonewtons of vacuum thrust and a reaction control system comprised of a number of thrusters. The upper stage is capable of accurate navigation using different sensors in order to achieve precise injection capability. Volga was tasked with a lengthy coast phase after its first burn to move to the apogee of its elliptical transfer orbit so that the second burn could act as a circularization maneuver. It was reported that Kanopus ST was aiming for an operational Sun Synchronous Orbit 702 Kilometers in altitude, inclined 98.7 degrees.